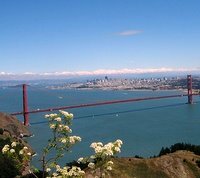 For a limited time save 15% on vacation packages to San Francisco or Sonoma wine country. Book your vacation package online at alaskaair.com from January 30, 2007, to February 13, 2007, for travel completed by April 30, 2007, and take advantage of this amazing offer. Simply enter promo code AS07SF0 at the time of booking to receive your 15% discount. If these packages don’t meet your needs, you can always search for the best rates on flights and hotels through BootsnAll’s legendary search engines.